The next generation is really why we're here today... The riverfront is the one common neighborhood for everyone in this area. The one neighborhood that everyone shares is the river, because afterall, that is how Paducah got here. The great old river is replete with history of the United States of America. I want to help the community enhance the river experience so that this common neighborhood that everyone has will be a place to go and enjoy yourself for years and years to come. Paducah Transient Boat Dock and gangway opened to the public on September 21, 2017. 2016-2017 -- Finishing of surface of park, construction of revetment, and construction of transient dock and gangway. Approval of an $8.11 million contract with MAC Construction & Excavating at the October 20, 2015, meeting of the Paducah Board of Commissioners for the construction of Phase I-B. Project will include the finishing of the park and installation of the gangway and 340 feet of transient dock. Re-advertisement for bids for construction of Phase I-B. Bid opening September 9, 2015. Advertisement for bids for construction of Phase I-B. Bid opening May 27, 2015, resulted in bids much higher than available grant funding leading the City to modify project slightly and resubmit to State for approval. Main change will be to require structural steel for the transient dock rather than the option of either steel or concrete. May 2015, agreement with Kentucky Transportation approved for the administration of Federal Highway Administration funds in the amount of $3,920,000. April 2015, received approval from the Kentucky Transportation Cabinet to move forward on project. During 2014, monitored the settling rate, if any, of the rock base and worked on getting State approval for plan amendments as recommended by PRDA and the City Commission. PRDA presented findings of months of review including the Riverfront Development Report-Study Recommendations at the April 15, 2014 City Commission meeting. In spring 2014, began monitoring the settling rate, if any, of the rock base for the park extension. PRDA held meetings approximately twice a month from October 2013 through April 2014 to review each element of the project. Ohio River Boat Launch scheduled to be completed in November 2013. 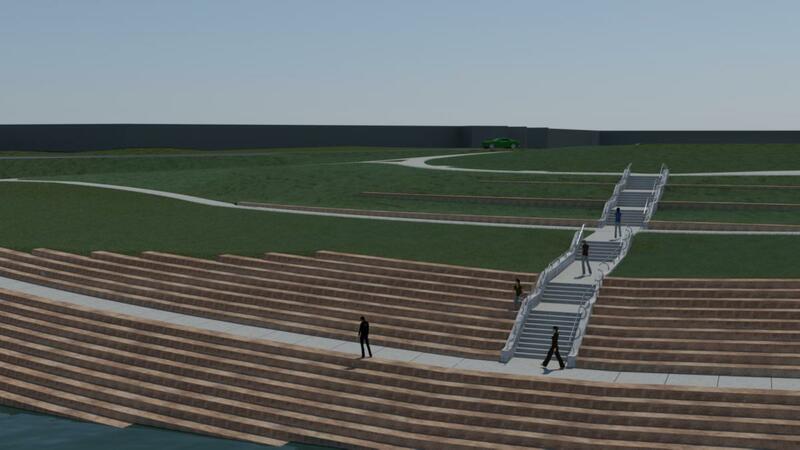 Ribbon cutting set will be held in Spring 2014 at the boat launch located at 6th and Burnett Streets. Steel pilings completed in October 2013 with majority of mass fill completed and in settling phase. Review of Riverfront Redevelopment Project assigned to Paducah Riverfront Development Authority (PRDA) in September 2013. Construction began in May 2013 for Ohio River Boat Launch project and mass fill/steel piling project. Advertisement for bids for Schultz Park mass fill project. Bid opening on April 4, 2013. Advertisement for bids for Ohio River Boat Launch project. Bid opening on March 26, 2013. Infill Ceremony held November 2, 2012, to kick off project. Relocation of mussels in October 2012. The Finding of No Significant Impact (FONSI) document was approved in July 2012 by the Kentucky Transportation Cabinet (KYTC and the Federal Highway Administration (FHWA). The Biological Opinion (BO) document from the U.S. Fish & Wildlife Service on impacts to freshwater mussels at the boat launch and marina/transient dock locations was approved in June 2012. The Environmental Assessment (EA) document (see more information below) was approved in April 2012 by the Kentucky Transportation Cabinet and the Federal Highway Administration. February 2017: On this Tell Me More episode, City Engineer & Public Works Director Rick Murphy explains the process to construct the 340-foot long transient dock. Video is from February 10, 2017. September 2016: This is aerial footage of the Riverfront Redevelopment Project taken in mid-September 2016. 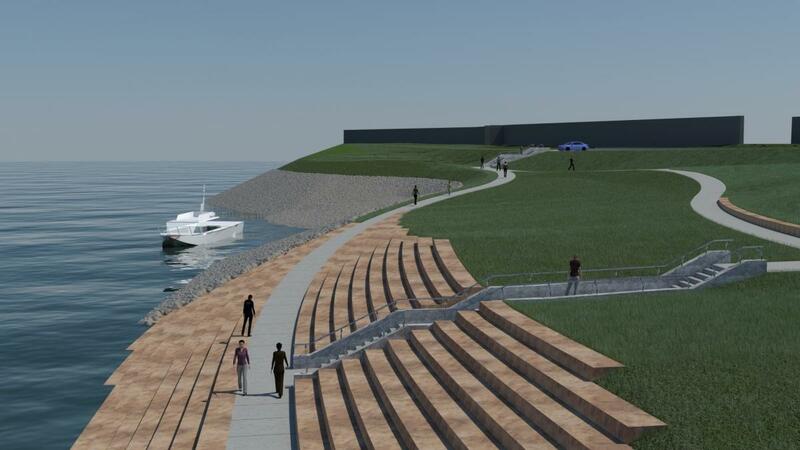 It shows the base of the large park, the revetment (stone steps), and the pilings for the gangway and transient dock which will arrive in November 2016. Thank you to Bacon, Farmer, Workman Engineering and Testing for providing the video. In June 2005, City of Paducah planning staff encouraged the Paducah City Commission to consider developing a quality waterfront master plan to plan for future development on the river and to show federal delegates this community’s serious commitment to riverfront redevelopment as a means to increase local tourism and spur economic development. Following on the heals of the success of the Luther F. Carson Center, the Commission agreed and authorized staff to hire a consultant to help the City with a riverfront redevelopment master plan. By 2006, local elected officials were thanking Senator Mitch McConnell for $5.3 million of federal funds approved for the improvement of Paducah’s riverfront area. The City has secured additional funding as explained below and worked through the extensive permitting process. The original plan has changed due to the presence of mussels in the Ohio River and the consensus to shift part of Phase I of the project 500 feet downstream. However, many of the original concepts are still proposed. The original plan documents are available at the bottom of this page. The Riverfront Redevelopment Project will take several phases to complete. Phase I-A, which was completed in 2013, involved the expansion of Schultz Park by adding fill material, approximately 230,000 cubic yards, into the Ohio River and the installation of 12, 36-inch steel pilings to support the gangway. The fill needed to settle at least nine months before the next construction phase could begin. Bids were opened for the mass fill and the steel pipe pilings on April 4, 2013. Construction began in May 2013 with the majority of the fill and pilings completed in October 2013. The larger park creates a downstream harbor that protects the transient dock and could be the site of a future marina. Please note that the marina is not funded at this time. In 2015, Phase I-B was initiated to complete the surface of the park. Also, in Phase I-B is the gangway which leads to a 20-foot wide, 340-foot long transient dock that is capable of being extended to 1200 feet in length in later phases. This transient dock provides boats of all sizes a location to dock and enjoy downtown Paducah by providing fuel, power, and sewer facilities. Note: The Services Building is not included in this phase. Click Transient Boat Dock, Services Building, and Schultz Park for schematic drawings of the changes. Phase I-B was completed in the summer of 2017. This initial phase also involved the construction of a new boat launch facility with an 85-space parking/trailering lot at 6th and Burnett just downstream of the Paducah Expo Center. The Ohio River Boat Launch includes a five- to six-lane boat ramp with an 8 by 80 foot gangway/courtesy dock. The project also included the construction of a paved boat launch access road consisting of improvements to Burnett Street from North 8th Street to North 6th Street over the floodwall to the new parking area and additional amenities consisting of landscaping and drainage improvements. The City of Paducah Engineering-Public Works Department held a bid opening for the Ohio River Boat Launch Project on March 26, 2013. Construction began in May 2013 with the project completed in December 2013. The facility has cameras and lighting. Future phases would address the area at the foot of Broadway. Before any changes would occur in that area, the Riverfront Plan would be revisited, the public would be involved in discussions, and the project would be updated. As part of the requirements under the National Environmental Policy Act (NEPA) of 1969, Federal agencies must consider the impacts ot the ecological, social, and cultural environments. Since the Riverfront Redevelopment Project is being funded through state and federal grants, the environmental impacts must be documented in an Environmental Assessment (EA) or an Environmental Impact Statement (EIS). For the Riverfront Project, an Environmental Assessment was discussed at a public meeting in March 2010. At a minimum the EA must address the project purpose and need, analysis of alternatives, environmental impacts, and planning and public involvement. The EA, approved by the Kentucky Transportation Cabinet (KYTC) and the Federal Highway Administration (FHWA) in April 2012, was presented at a public hearing held at City Hall on May 30, 2012. The public was able to provide comments through June 14, 2012 that were incorporated into Finding of No Significant Impact (FONSI). The Environmental Assessment document above is not the first one completed for this project. A document was completed in November 2009; however, a petition was filed by an organization against the project location due to the concentration of mussels, some of which could be endangered, found in the Ohio River. To satisfy the petitioner and limit the disturbance and mitigation of mussels, the project was moved 500 feet downstream. This necessitated the completion of a new EA document, the one approved in April 2012. The City of Paducah worked with available grants to coordinate construction phases. Using available grant funding, the City completed the Ohio River Boat Launch project at 6th and Burnett Streets, the expansion of Schultz park (just downstream of the existing Schultz Park), the gangway, and 340 feet of transient dock. At this time, the City of Paducah has approximately $10 million in State and Federal grants. This includes the nearly $5.3 million presented by U.S. Senator Mitch McConnell in 2006. Note: FHWA stands for Federal Highway Administration. HUD stands for Housing and Urban Development. USFWS stands for U.S. Fish & Wildlife Service. BIG stands for Boating Infrastructure Grant. ISTEA stands for Intermodal Surface Transportation Efficiency Act. The Paducah Commons Small Area Master Plan covers an approximately six square block area located on the Paducah riverfront between the Convention Center and the rehabilitated Schultz Park and transient dock. The site is key in that it exists adjacent to the Holiday Inn Paducah Riverfront which opened in 2017. The park will act as a major transition between Downtown Paducah and the Convention Center. The City is interested in how the space may be used as a new park and how the park may connect the Riverfront as a spur to private redevelopment in Lowertown and from the Convention Center to Downtown. Formally deciding on appropriate uses in order to craft an implementable plan. The process was a collaborative effort between RATIO’s project design team and the Paducah riverfront stakeholders of neighborhood, community and business leaders. At its July 10, 2018, meeting, the Paducah Board of Commissioners approved applying for the Better Utilizing Investments to Leverage Development (BUILD) Transportation Discretionary Grant. Applicants can apply for up to $25 million for transportation related projects that have a local and regional impact. The City of Paducah is partnering with the Paducah-McCracken County Port Authority to seek grant funds totaling $24,895, 759. The program of projects is called Riverfront to Riverport: Investing in Paducah’s Maritime Hub. The Port Authority is seeking $10.8 million to construct a loading area for general cargo and containers. The City’s funding request, which totals slightly more than $12.6 million, would be used to construct a landing/excursion pier to provide a docking point for the steamboats that visit Paducah between April and December. This landing/excursion pier was identified as a project to enhance Paducah’s riverfront in the 2007 Riverfront Master Plan created by JJR. Also, the City’s funding would be used to develop the former Executive Inn site into the Paducah Commons. A master plan for that area was completed by RATIO Architects in 2015 with additional design work completed by Bacon Farmer Workman Engineering & Testing. Some of the Paducah Commons elements include a sculpture walk, vendor areas, a great lawn, a performance area, walkways, and seating. If funded, the City would have until the summer of 2020 to begin construction. The original Riverfront Redevelopment Plan was adopted by the Paducah Board of Commissioners in April 2007. Some sections of the original plan have since been revised. Most of the documents below are from the original plan. There are two documents from a revised Schultz Park plan from November 2007.